In this section of the project, I will configure the Shared Uplink Sets on the Virtual Connect Manager, create LACP groups on the HP 5900AF and add the new uplinks to our VMware vSphere 5.5 Distributed Switch. I also include a short brief on setting up LAGs in the vSphere Web Client. The basic idea is to create Active/Active links from each Virtual Connect Module to each HP 5900 switch. In the previous section, we configured the two switches as an IRF domain. In this setup I am using X1-X2 on each Virtual Connect for Management, vMotion and iSCSI. For the Provisioning Uplink set I am using X3-X6. Unfortunately, I’m waiting to receive more SFP+ adapters that are compatible with the Virtual Connect, so to start, we will only use 2 links from each module(X5, X6). Each Virtual Connect module has its own link aggregation group on the ToR. The management Set will use group 1000 for VC module 1 and 1001 for VC module 2. The provisioning set uses group 880 for VC module 1 and 881 for VC module 2. To begin open up a terminal to the HP 5900 switch. After logging in we create link aggregation groups for each shared uplink set. 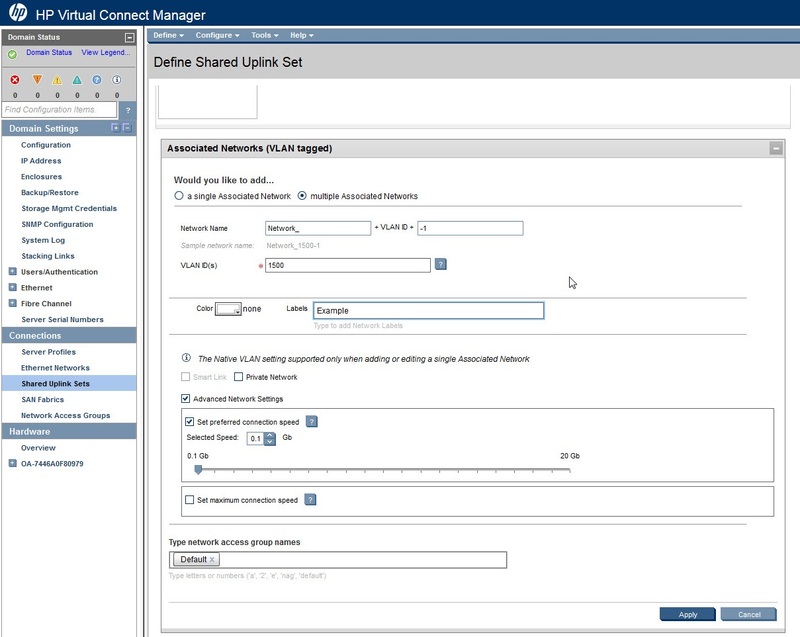 Now configure and add ports to the Shared Uplink Set link aggregation groups. Even though I don’t have all the SFP+ adapters, I still want to configure all of the ports on the 5900. Below is an example for the first two, group 880 and 881. I also want to configure Bridge-Aggregation groups for my Access switches that will connect to Bare-Metal hosts on specific VLANs. There are two Access Switches for each provisioning VLAN (refer back to the project summary). Now that LACP is configured on the 5900, we can continue by creating Shared Uplink Sets. From a web browser log into the Virtual Connect Manager. Select Shared Uplink Sets and add a new set (+Add). When adding the Uplink Set Name, we differentiate each module by designating ‘-1’ or ‘-2’. Click to add an Associated Network. Much like the naming convention for Shared Uplink Sets, we want to split the connections so we can add more than one adapter to the ESXi hosts. This completes the Shared Uplink Set creation. Now we can create Server Profiles and assign networks. Currently we only have 4 uplinks coming from each Virtual Connect module so we will add 6 ports (Management 1-2, Provisioning 3-4 and a set for 4Gb iSCSI using port 5-6). With future expansion, I hope to add FCoE storage along with a set of Flex-10 modules and mezzanine cards. Then I will move the Provisioning Uplink to the new modules and incorporate FCoE storage using the FCoE HBA connections on our current FlexFabric VCs. List of Shared Uplink Sets. We reserved 2 uplinks that will be configured at a later date. Configuration of MGMT-1 using VC 1 ports. Configuration of MGMT-2 using VC 2 ports. Configuration of Prov-VLAN-Trunk-1 using VC 1 ports. Configuration of Prov-VLAN-Trunk-2 using VC 2 ports. Completed Server profile including multipathing for iSCSI on FlexNICs 5-6. View of VC module 1 Uplink Ports. View of VC module 2 Uplink Ports. To add the uplink sets to your distributed switches in vSphere, simply navigate to Inventory>Networking, right-click the distributed switch and select Add Hosts. Select the vmnics and the destination Port Group. For iSCSI multipathing, only one link should be configured as active, while the other is unused. VLANs for each port group should be configured as VLAN Access. With preconfigured distributed port groups, select either Add Hosts or Manage hosts to migrate vmnics to distributed port groups. Add Host vmnics not associated with the distributed switch. Migrate existing vmnics on the distributed switch to new port groups. For both VMkernel and Virtual machine port groups you should configure VLANs and Teaming & Failover. Only one uplink should be active for iSCSI multipathing. Multipathing: display of iSCSI software settings. MGMT distributed switch for ESXi host 1. 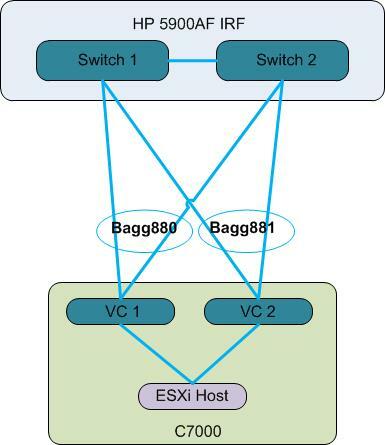 Provisioning distributed switch for ESXi host 1. Note the VMware LACP. For those that want to test out the inclusion of LAGs with vSphere, here’s a brief rundown. Log into the vSphere Web client and navigate to the Networking tab. Under the Settings tab for the distributed switch, left-click LACP and select to add a new LAG (+). Select the number of uplink ports, choose ‘Active’ mode and choose your desired load balancing mode. Then Manage Distributed Port Groups and set the LAG as a Standby uplink. Set the uplinks used in the LAG with the Manage Host Wizard and finally, move the LAG to the Active uplink and the former uplinks to the ‘unused’ section. Log into vSphere Web Client. After creating the new LAG, move lag1 to the ‘Standby uplinks’. Move your physcial vmnics to the new LAG. Change the state of the LAG to active. Honestly, having just started the page in June, I was more worried about content creation. I have a great deal of documentation I still need to post and I wanted to make sure that there was enough content available to make it worthwhile for visitors. It’s nice to know my little endeavor is catching a few eyes. Hopefully it’s been helpful. I made the site hoping to assist others like myself. That’s one of the reasons it takes so long to create new posts as I spend a lot of the time going back over procedures I have done in the past so there are accompanying images. Demystified our first pair of 5700s and C7000 virtual connects. Thank you very much. No problem. That’s why I made the site in the first place. Kind of a savior for those like myself that are trying to do it all themselves. I was debating on updating this guide to show how to transition this build into a full fledged HP CloudSystem, as many of the procedures are the same. I’ve modified the original intent and design of my lab since starting this site by taking the individual tools and deploying Ansible for an overarching solution. I think I’ll just add a blog to map out what I’m working on if I can’t make a new guide. As I’ve spent the last year either studying for cert exams or coordinating onsite customer installs around the country.